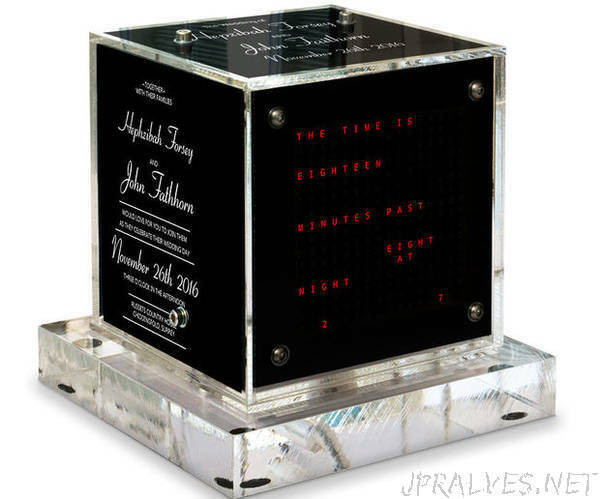 Relatively easy to build Word Clock using a Arduino Nano and four MAX7219 32mm Dot Matrix Display ModulesChoice of styles, picture frame or Perspex cube with various base options. There are modes, digital clock, analogue clock, temperature & humidity, & also three games, Game of Life, Simon & Tetris. When running as a slave off a Master Clock time is synchronised on every 30 seconds past the minute. There is an option for PIR/Microwave Radar Sensor control so the clock automatically turns off when no one is in the room. The Clock display measures 64mm x 64mm and is designed to be desk mounted although the picture frame version could go on a wall. There are touch pads in each corner to setup and control the clock. A mini USB socket allows software programming in situe. Plugging in an Android phone/PC allows setting of the time and choice of what mode to display on startup. Time setting can also be carried out in the digital clock mode using the touch buttons. The clock draws 20mA (all LEDs off) to 40mA (LEDs max brightness) from it’s 12v supply. There is a choice of designs. Picture Frame Clock pic 1 or a Perspex Cube Clock pic2. Each design uses a different Veroboard layout but shares the same code. Full details also available on my Word Clock Mini web site.